Get your busy life under control with a custom planner built for you! Put an end to the chaos, the messes, and the stresses. 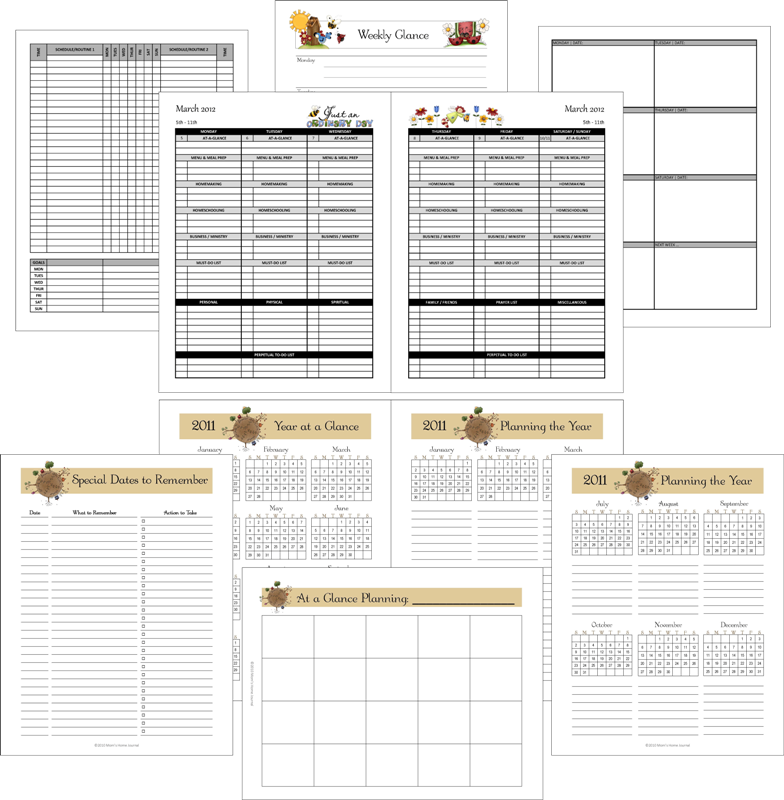 Mom's Household Planner for ALL seasons ... a themed home management binder system for moms who have their hands FULL. 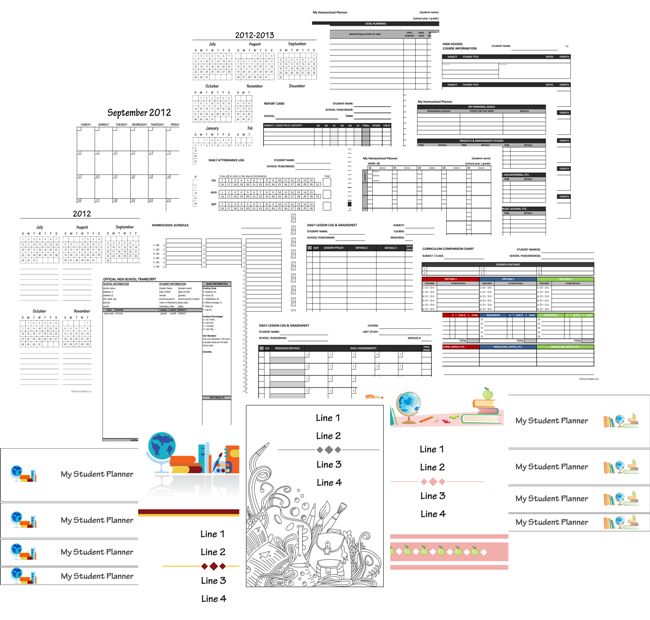 A large collection of customizable planner printables. Build a customized system to take back control of your household! Seasonal artwork breathes new life into your planners every 3 months. Not just a bunch of cute templates ... they are first and foremost functional. Your lifetime membership comes with all currently available and future planner pages. Unlimited access ... download forms when you want, as many times as you want! You pay only ONE time, but you get updated calendars every year! As a work-at-home, homeschooling wife and mom of many, flexibility and adaptability are a MUST to keep me moving in a positive direction. Mom’s Household Planner is not just a bunch of cute templates. 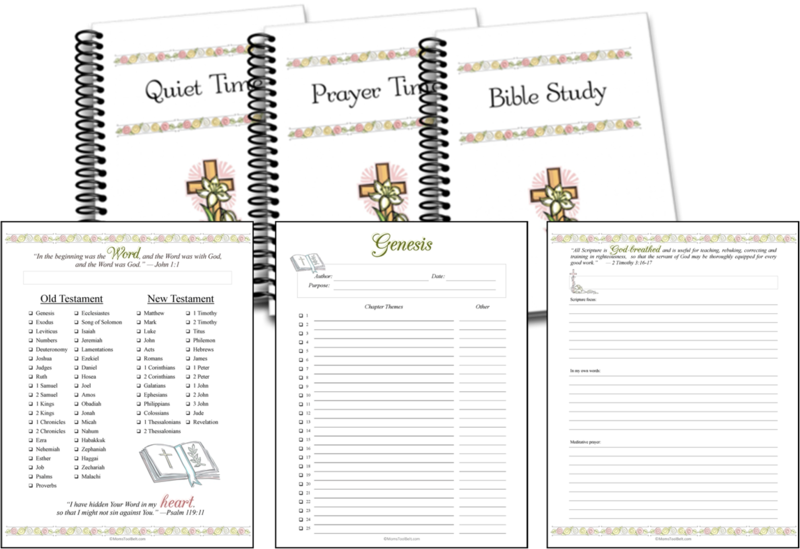 These templates were thoughtfully designed to create a planner that would really work FOR ME (and you) throughout the year. There are a variety of options for most pages. Most are open-ended AND customizable giving you a variety of ways to utilize them. Mom's Household Planner LIFETIME Membership? Below is a partial list of what's included with your membership. 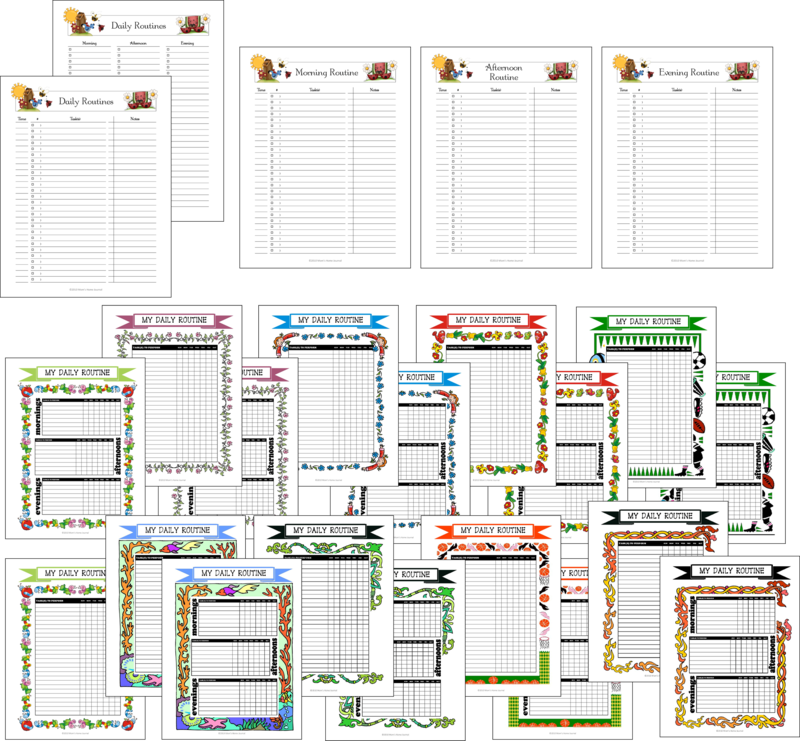 We have many do-it-yourself editable planner pages. Customize these pages with your own headings, fonts, backgrounds, etc. Click here for more details & samples. Assignment Book Covers, Spines, Dividers … multiple designs including "create your own"
Here is a SMALL sampling of the pages in our system! 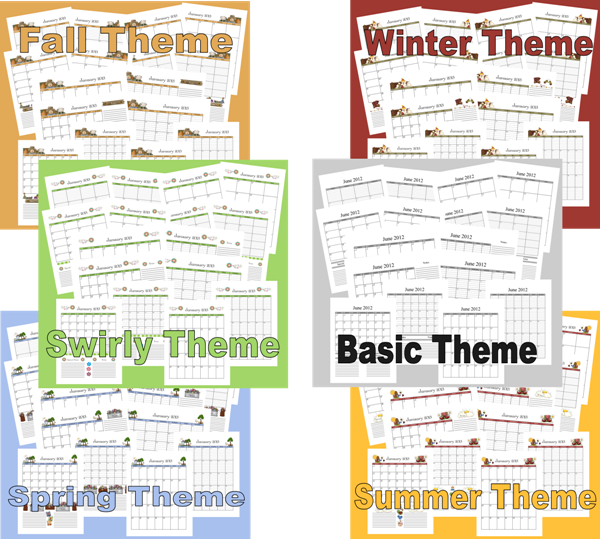 Check out the HUGE VARIETY of calendar layouts! is just a ONE TIME payment of $24.95. You retain access to ALL of our downloads, printable forms (and future updates) with this one-time fee! You are purchasing a downloadable product. At a minimum, you will need the free Adobe Reader program to download, edit, and print PDF files. For do-it-yourself options, you will need a program that handles spreadsheet files (OpenOffice Calc, Microsoft Excel, etc.). Read what our members have to say about Mom's Household Planner below! I have asked our Mom’s Household Planner LIFETIME Members to share their thoughts about our Membership Program and here’s what they have to say! I have used numerous planners, forms, etc, in the past. I love the Mom’s Household Planner because I use it all the time! We use the calendars, the home school planning forms, etc. I love that I can print out my own planner. It is wonderful for keeping our family more organized. I like that I can print what I need, whenever I need it, instead of searching for a printable calendar. Thank you! And I love the designs, the calendars, the planning forms, household forms..By the way, each of the other planners asks you to renew every year. That means more $$ on for planning. We are a single income family of 6, so every little bit helps. I use the calendars for bill paying, for our schedules for school, as well as for marking appointments, Awesome! I have been using the Moms Tool Belt for several years now. I LOVE IT !!! I started out slow and created only one section at a time. In a short amount of time and using only 5-20 min. at a session, I have built my organizers. I have a Household Planner with calender, budget/billing info., Addresses, Gift charts, Emergency contacts, and soooo much more. I have a Home School Planner with Lesson Plans, Form and Documents necessary to fulfill state requirements, and again, soooo much more. I have a Recipe Book with favorite and often used recipes, menu plans, and grocery list sheets. There isn’t one planner that I have created that doesn’t get used daily. 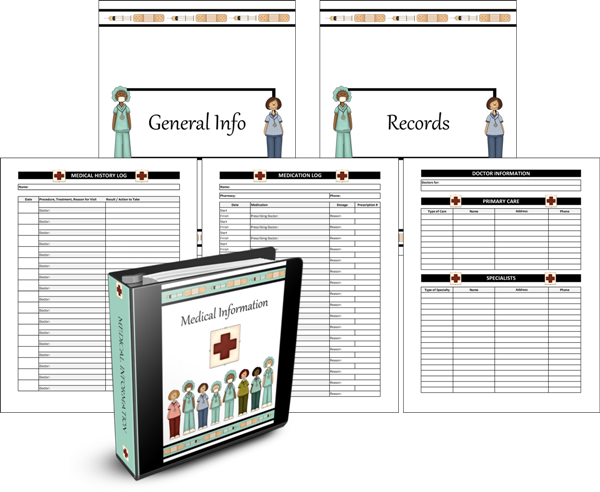 I put in only what is pertinent to my family, customize forms to meet our needs and have a personalized organizational system just for us. You can do it too. It really makes life sooooo much easier for everyone. Stress gets reduced. People are happier. Thank you Debra Reed for creating, teaching, and sharing the gift of organization with my family. May the Lord Bless you for how you have used your talents. I am a mom with a household of 8. Mom’s Household Planner has been wonderful about helping me keep our day to day lives organized and in one place. I used to get stressed because of all the papers and clutter in my home office and now it is all gone. Thank you so much for such a wonderful product! I Love the Mom’s Home Journal. It has the perfect variety of forms and the artwork is beautiful. I really liking the lifetime membership. This is the nicest, most customizable personal organizer I have found. I LOVE the colors, themes, and tons of options. Thank you!! Thank you for sharing your talents and gifts with us, Debra! I have tried many planners over the year, but never fully used them as they were intended. Now that I have my household planner on my kitchen counter, I can quickly grab it to organize our home, one step at a time. I love the different styles you have available, and it was hard to choose just one! 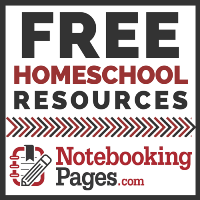 I am looking forward to using the homeschooling student sheets planner for next school year. Our children are going to love it! Thank you! This was just what I’d been looking for!!! Custumizable, LOTS of options, and she’s done all the work for me!! For what you get, the price is unbeatable!! Thanks Debra!! I have been looking at purchasing this since you first introduced it. I am not very good at keeping up with planners, but I decided that 2013 is going to be my “Get Myself Together” year. I appreciate all the time you invest in this site and Notebooking Pages. Your hard work enables me to spend more time with my children. May God continue to bless you and your family. Merry Christmas. Thank you, Debra, for making this tool available to us mom’s that need things like this. I love to be organized and with homeschooling 2 kids, this is a necessity! Also, thank you sooo much for the lifetime membership! God bless you. Debra has a wonderful talent, the Lord has blessed her with. I am thankful she shares it with all of us! So excited about using these planners! The artwork is beautiful and the variety of planning sheets is going to make it so easy for me to customize planners that will be just right for my life and my family. Thank you, Debra, for making this available and for the lifetime membership with no renewals! This has been such a great investment. I have used almost all of the pages and since so many of them are editable, I have been able to create lots of completely new forms that are exactly what I need!! I love Mom’s Household Planner! It has helped me get organized without all the work…it was done for me. The print outs are so cute. Definitely a good investment. 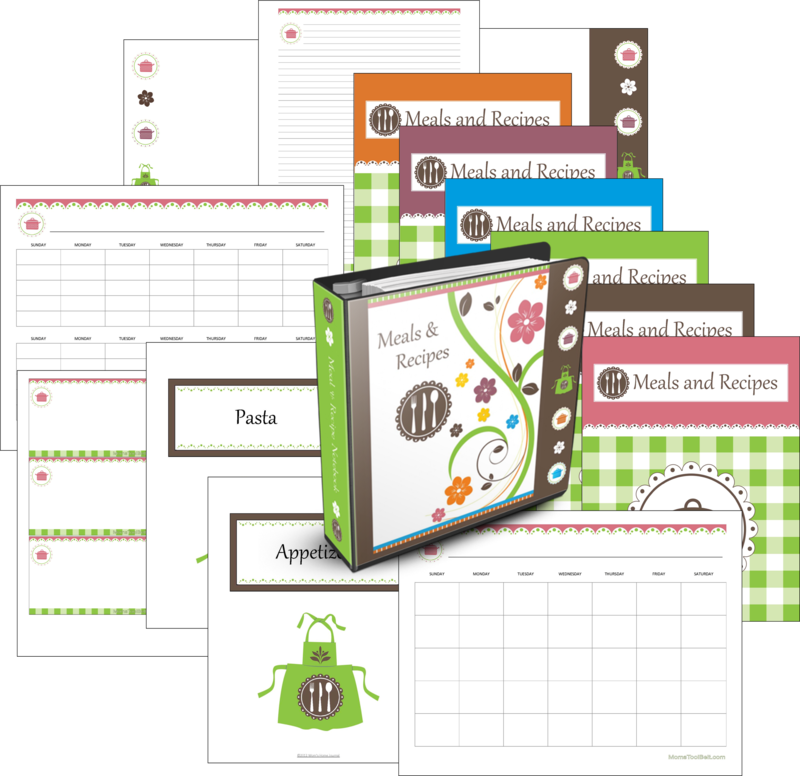 I just purchased the Mom’s Household planner, though, I can testify … it’s the BEST! I have used all the “freebies” in years past and whatever I could get my hands on. 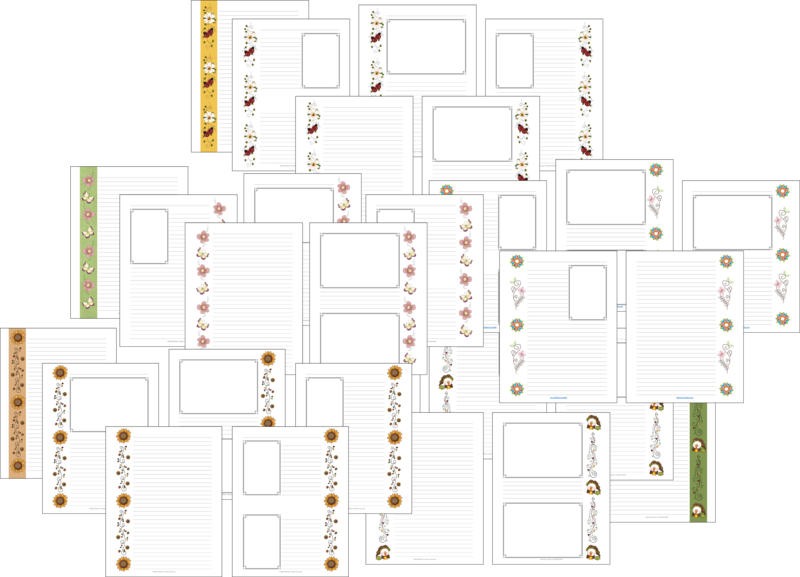 I have used and purchased many Notebooking Pages as well. These are such a blessing! 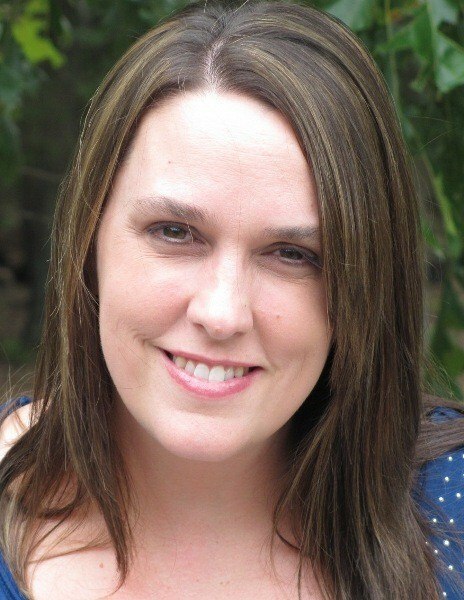 There is nothing better than a Mom with a mission…DEBRA! Experience is the best teacher, and her ideas and hands are teaching us how to utilize our time using her talents! May the Lord continue to bless you as you serve us! 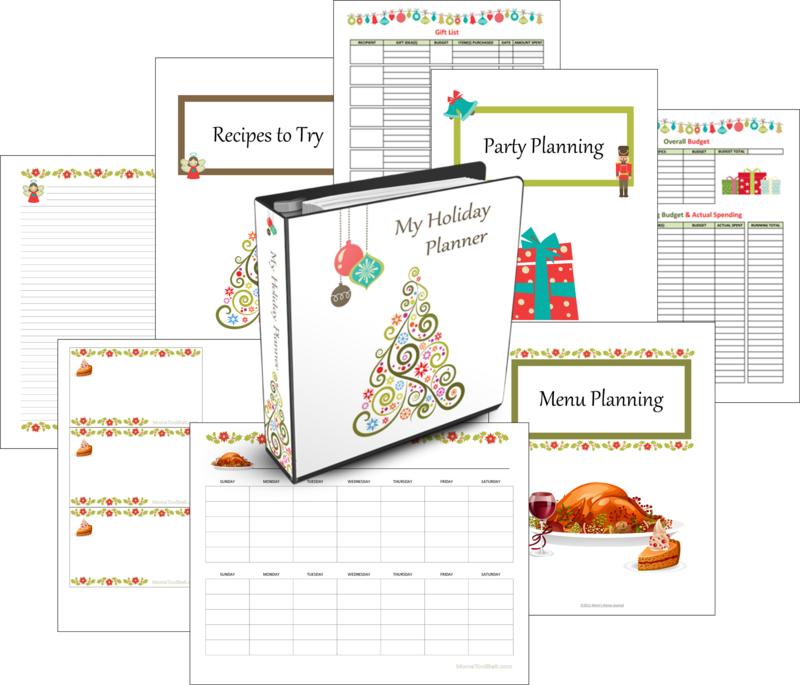 I’m so excited about the holiday planner pages! I’m always so grateful for the updates as you seem to know just what I’m needing at that moment. Thanks for being such a blessing. I have purchased MANY planners trying to find the “right one”. Each one I purchased seemed to be missing one or two important pages I really needed… with Debra’s planner you can pick and choose everything so you can design your own. THIS IS THE RIGHT ONE!! In trying several planners before coming across Debra’s method – you can’t go wrong here, honest! She has provided everything you need and then more! You choose to use what you want to make the planner your own and the sheets work, they really work well for anyone! I have been with Mom’s Household Planner for about three years now and look forward to getting the email about updates and new forms, because that means I can add to my planners or change something, when and if I want! This is a system that works for anyone, promise! For a low price you can download what you want when you want. When new forms come out you have access to those as well. You can’t beat the price of a lifetime planner – I feel I have more than received my money’s worth with this planner – Thanks, Debra, for an awesome system! These resources are amazing! I love that there is always something new to add to my planner and help me to stay even more organized! As a homeschooling Mom with 4 small children, this planner is such a blessing. The designs are wonderful too and so much fun. This was very much worth the price and I highly recommend it! I have tried many different planners, never seeming to find ” the one” . I love these pages. I can customize them any way I need, and printing out as many as I need. I resisted planner use for years. I didn’t want to be tied down to a schedule….even my own! But after finally breaking down and using one, I found I liked having a plan, however, I had a terrible time finding a planner that I liked and could use the way I wanted to use it. I was so happy to find Debra’s planner…I can print out only what I want (and there’s a huge array to choose from) and I can arrange and re-arrange it to my heart’s content. I never feel tied to it or stifled by it…I only feel organized. This planner has been a huge blessing to me and to my family! This is the best thing for busy moms!! When I saw that the price was so low, I immediately joined! love it!!! When I became a full-time stay at home mom, I left my planning pages behind. What a mistake! The problem was, I didn’t want a strictly business format, and if I was going to use planner pages, I wanted to find something that was both pretty and practical. When I stumbled on Moms Tool Belt I was pretty impressed! I loved the seasonal look – and then came the floral pages and the editable pages – and I am HOOKED forever. These are the BEST planning pages I’ve ever found and I think my membership is worth every single penny!!! I have never been the most organised person. I was constantly looking for some lost paperwork here or there, struggling to remember weather or not I paid a bill, remembering which of my kids has an appointment where and when etc. Mom’s Household Planner has helped save me soo much time! For instance, just the other day my Husband was on the phone with our health insurance company. They needed one of our children’s social security numbers as well as a copy of our Marriage License. He began to tell the representative that he would have to get back to him when we found them… the look of amazement on my Husbands face when I opened my planner and laid it in front of him with a copy of the Social Security Cards and Marriage license was PRICELESS!!! Definitely worth the investment! We Home school 4 children the planning sheets have made compiling our end of the year portfolios soo much easier! No more trying to remember resources used, compiling book logs etc. from memory at the end of the year! Each kid has a planner and they help keep track of what they read through the year, samples of their work, what their assignments are and how they are working through them on their own! I have recommended Mom’s Toolbelt to all my friends and family and will continue to for the rest of my life! Hello. My name is Donna, and I am a…a…a list-a-holic! Therefore this site has been such a fun and awesome blessing to me! The pages are useful, pretty, and easy to print up! I am looking forward to a new year with these lists! I wish I would have had these back when i was home educating. I could have had everything not only in one place, but all matchy match…which for a crafty/artsy/ocd person like me that means something! Wishing you all a fantastic new year full of blessings that will knock your socks off! I love this planner. It is easy to customize and make it your own. The ideas are endless. I’m new to this system, and bought it because I really needed something to help organize my holiday budget & gift giving. What a tremendous help it has been! Super easy. Personalized. Makes a place for all those lists I’m good at making and losing. I’m now looking forward to implementing all the other parts of the system for the new year! Thanks, Moms Tool Belt! I love my planner. It is pretty and practical. There are so many colorful coices, if I get bored with one theme I can choose a different one. 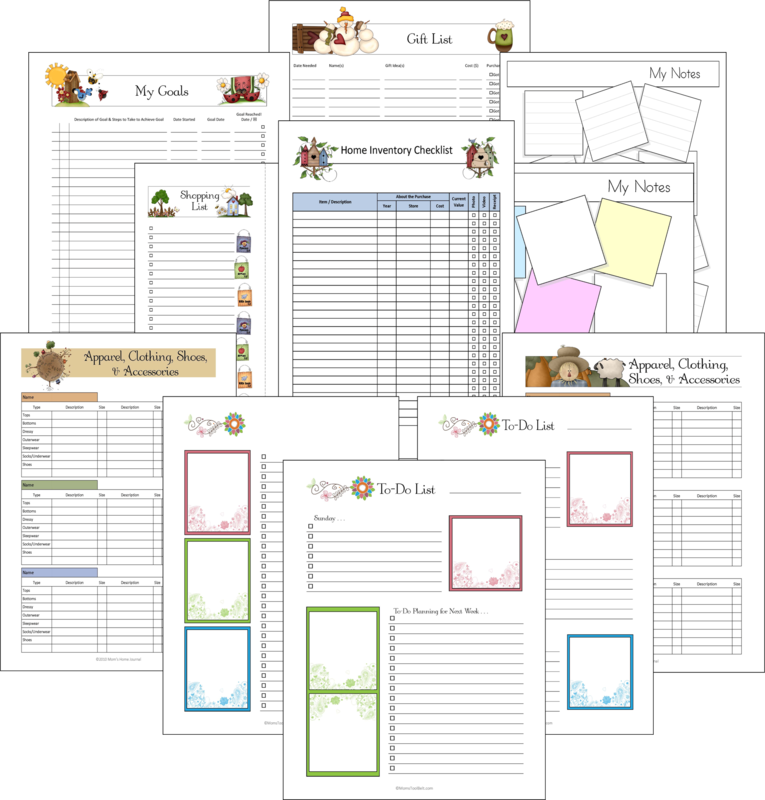 There are planner pages for calendar, homeschool, budget, household, holidays. There are new pages every few months. I love the post it note pages, they are great for organizing thoughts. You will not be disappointed. I really enjoy using Mom’s Household Planner. The pages are so helpful and easy to use. The variety is astounding, and to top it all off, they are beautiful/cute/whimsey. I love the different themes. We are a large family, and I consider my planner to be an indispensable aid in keeping everything running (mostly) smoothly. Thank you! PS: Love the lifetime membership!! A good friend who taught me about Charlotte Mason Home Schooling impressed me with her beautifully organized bookshelves lined with notebooks that were covered with Mom’s Tool Belt graphics. I HAD to get this for myself!!! 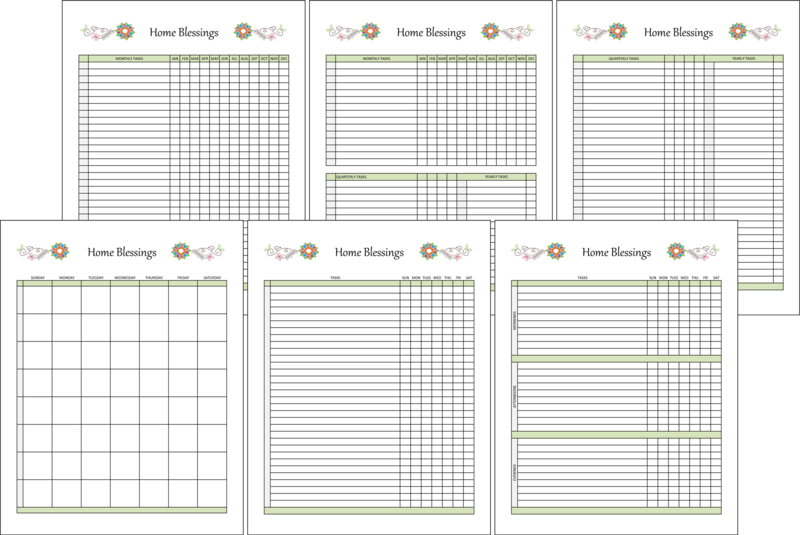 Ive looked at many home management printables and I have to say these are by far the most useable and affordable, not to mention adorable pages around! I love that I can change my planner to fit the season ( although, Im partial to winter and usually always have those!) Thanks so muh for your work and time you put into these!